The Russian Alternative Presents: The 20th Golden Hat modeling and painting competition! We are pleased to announce that this Golden Hat has been sponsored by The Russian Alternative! They have offered up prizes for contestants placing 1st, 2nd and 3rd! We are very happy to say that we would love to take part in this contest! We are prepared to provide sets of our Dwarves of Fire Canyon models (Dwarf+Unit+Command Group) for all three prize places! That sounds awesome to me! Each winner will receive a unit of Dwarfs of Fire Canyon, a command unit and the Dwarf of Fire Canyon hero - that's 14 of these fantastically sculpted multi-part metal models to each winner!! Did we also mention that our very own Rozmax is the sculptor? No?! Well more of his work can be found here. Of course if you can't wait for the end of the contest to get your hands on some of these models you can always get a head start over at http://russian-alternative.ru/. In addition, we'd like to have some random-draw giveaways so that any participant will have a chance to win a prize. If you want to contribute a prize, you must be willing to pay for the shipping to send it to a fellow member. How powerful/amazing/frightening/inventive/fantastic Chaos Dwarfs are! The challenge for Golden Hat #20 is to give your creativity and skills free reign while showing off just how cool Chaos Dwarfs can be! That's it. Think of the coolest thing(s) you can paint and go with it. The entry an be anything you like. It may be a single model of any size, it may be two models locked in a duel, it may be a unit, multiple units, one or more warmachines, a whole Chaos Dwarf outpost, city, shipyard, an entire army on a display board, anything - as long as it is painted. Your entry need not be limited to a literal "Chaos Dwarf" piece either, and any reasonable 'slave' model(s) can be entered as well. You can convert or model your own figure(s), or use any existing model(s) from any miniatures range. Just make sure it is fully painted and hasn't been shown in its completed state before (although WIP shots of any conversion or modeling work are welcome in the submission photos). The choice is unrestricted this time, so you may choose to go with a diorama style, a plinth, or any other sort of base - or no base at all. If for some reason you are having trouble with your submission, contact one of the Staff before the deadline. In order to avoid problems, we strongly advise entrants not wait until the very last minute to submit their entries... As things can and do go wrong at the last minute. Please do not send entries to individual Admin or Staff members to submit on your behalf as they may not check their PMs! - Take your place in the Golden Hat Hall of Fame, where your glory will be remembered for years to come. - If you place in the top 3, you'll win a prize, courtesy of The Russian Alternative. *= As with previous Golden Hats; if there are more then 10 entrants the Silver and Bronze Golden Hat Medals will be awarded as well. Subject Matter: Create anything you like that will showcase just how great Chaos Dwarfs can be! If any forum members would like to help "up the ante" by donating models or other materials as prizes, feel free to contact myself or one of the Staff to help sort out the details. I myself will be donating a bag of Warhammer Fantasy bits to one random entrant, and I'll make sure it is a good pile of stuff too! That's it, so get those slaves back to the forges and salt mines and let's have a record-setting number of entries for GHXX!! Congraz to all involved staff members! Great work (as usual) and esp. the new banner and the finding of a sponsor are awesome! Like always ... haste makes waste! Now I have to make my choice what I will build and paint! High Lord Sorcerer Messiah on shield carried by steampowered Dawi Zharr? 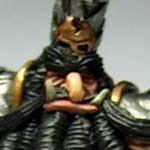 Chaos Dwarf Siege Airship of Armageddon? The whole tower city of Zharr-Naggrund? Hashut?! WIP shots of conversion work is okay on my blog? Or should I keep it all completly secret? I have two ideas for this comp. I am going to have to pick one and do it. Oh my...I will have to just gather my thoughts, and maybe even create some sort of timeline to follow, so I don't run out of time. I'm really looking forward to see what everyone creates. Ooph.. It's going to be hard to figure out what model to use for this, but I'm looking forward to the progress! It is OK if they've already been posted to your blog, but generally from this point forward it should not be shown until after the competition has closed and results posted. This is partly to keep entries and entrants secret until the creators are revealed at the end of the competition. Even if you make something amazing you're opening up your entry to early criticism, and the Internet being what it is, even a couple of people who may have voted for you might vote otherwise if they saw your WIP and then subconsciously think that you didn't complete it or paint it as well as they imagined. maybe even create some sort of timeline to follow, so I don't run out of time. So I put together a timeline last night. It's funny how tasks expand to fill the time you have. Even making week-long task specific blocks through the entire 8 weeks I'm still unsure of how I'm going to finish what I want to make in time... let alone have time for real work or training. This is a cool theme and im sure it will attract some of the best entries we have seen in a while but i think ill have to skip this one. The only thing ive got left to paint are a few models to finish up my last few units which leaves me with my whole army as an entry lol. I'm definitely in this one. I know I often say that, but I'm sick of painting rank and file and need something cool to do. This post was last modified: 10-03-2013 05:13 PM by Grimstonefire. Sweet! I'm in! Supercool banner Nico, really really love it!!! I'm in, but man... what am I gonna do? I'll have to come up with something once I am back from Italy. I'm in the airport now. Starting my vacation in Rome!